Seattle's dedication to parks and natural spaces is almost as old as the city itself. In the late 1800's the city employed the nation's first landscape architecture firm, the Olmsted Brothers of Brookline, Massachusetts. Having inherited the company from their father (who designed New York's Central Park and the campus of the University of California at Berkley), the brothers set out to plan Seattle's boulevards and green spaces. Today the city's parks and public spaces are one of the greatest contributions to the high quality of life enjoyed here. With two and a half miles of sandy beach that offers spectacular views of Puget Sound and the Olympic Mountains, it's easy to see why Alki Beach is a popular place to spend a summer day. The location was the site of the first landing of settlers in 1851, and an elaborate amusement park sat at the north end of the beach in the first half of the 20th century. Today the park features a wide path perfect for rollerblading and biking, picnic tables and designated pits for beachfront bonfires. This 14-mile paved path begins at the north end of Lake Washington and ends at Gas Works Park in Seattle's Wallingford neighborhood. If you traveled the trail's full length you would pass through quiet forest, alongside fresh lakefront, around the picturesque University of Washington campus, and into the bustle of the city. The trail's width allows walkers, runners, cyclists and skaters to comfortably share in the serene experience. Some active residents even commute to work on the Burke-Gilman. Click here to see the Burke-Gilman trail map. Discovery Park's 534 acres of forest groves, open meadows, tidal beaches and dramatic sea cliffs can easily make you forget that you're still within the city of Seattle. Located on Magnolia Bluff overlooking Puget Sound, the park boasts incredible views of both the Cascade and Olympic mountain ranges. The park also features a number of natural education programs for people of all ages. The site of Seattle's old gasworks was converted into a park in the late 1960's, and today features one of the best views of downtown Seattle. Located at the north end of Lake Union, the park's large hill is a favorite for kite flying and for sledding on the rare snowy days. Many of the once-industrial buildings now house park attractions, and the park itself is one of the best places to view the fireworks displays on the 4th of July and on New Year's Eve. 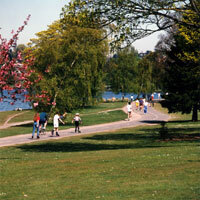 Green Lake Park has been one of Seattle's most popular landmarks since the early 20th century. The paths that encircle the lake (a 2.8 mile paved path for mixed use, and a 3.2 gravel path for joggers) are busy throughout the year. During spring and summer the green spaces and athletic fields are filled with picnickers, kite flyers and field sports of all types. The lake itself provides a great location for rowing, windsurfing or kayaking. 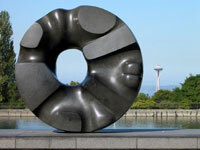 Originally a Naval station and airfield, Warren G. Magnuson Park is now the second largest park in Seattle. The park features a swimming beach, a motorized boat launch, walking trails, and the largest off-leash area for dogs in the city. The buildings of the old base are now home to a wide variety of non-profit arts, environmental, sports and community organizations. Bailey Peninsula is a 300-acre swath of forest, meadow and beach that extends into the southern half of Lake Washington. Seward Park features miles of hiking trails, a swimming beach, a Greek-style amphitheatre, picnic facilities and tennis courts. Originally named City Park, this 45-acre spot on Capitol Hill was renamed in 1901 to honor those who had volunteered to fight in the Spanish-American War. The Volunteer Park Conservatory can be found here, containing five "houses" filled with amazing displays of plants from around the world. The park is also home of the Seattle Asian Art Museum. 230 acres of oaks, conifers, camellias, Japanese maples and hollies are to be found in this dynamic living museum. Managed by the University of Washington's Center for Urban Horticulture, the Washington Park Arboretum is a sublime urban green space on the shores of Lake Washington. The Japanese Garden can also be found within the arboretum's boundaries. For more information on park programs and a complete list of city parks, visit the Seattle Parks and Recreation homepage.